This item is usually eligible for purchase using a Flexible Spending Account. Although this product is FSA eligible, FSA coverage can vary from plan to plan, and your individual employer ultimately determines which products and services are eligible for coverage. Please contact your FSA account administrator for your account details. You are buying the Mabis DMI Traditional Wood Cane 1 Men's Walnut which is manufactured by Mabis DMI. Mabis is a leading manufacturer of Walking Canes. At ADW Diabetes, we do our best to offer the complete product line by Mabis with excellent pricing and fast shipping. Item added to cart successfully. 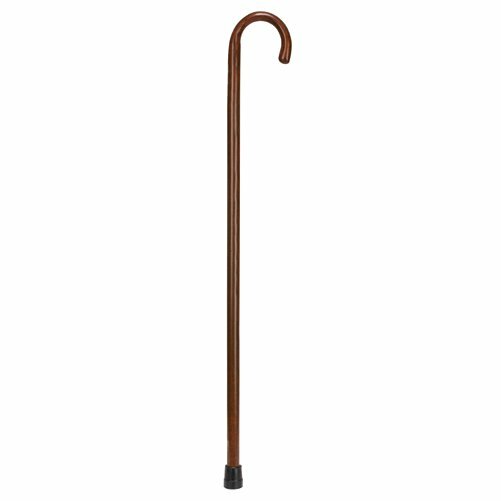 Men's deluxe wood cane. Made from strong walnut, stained and sealed finish and heavy duty metal reinforced rubber tips for lasting durability. Canes is in traditional round top. Cane is shipped in 36" length and can be cut down to desired height. This is a special order item that requires an additional 3-5 days for delivery. Express shipping options are not available for this item. Thank you.